Trump Tower In Toronto Is Up For Sale And Facing Legal Woes : Parallels The Trump International Hotel and Tower in Toronto has gone bust. Investors have lost millions and Trump has been sued, along with the project's two Russian-Canadian developers. 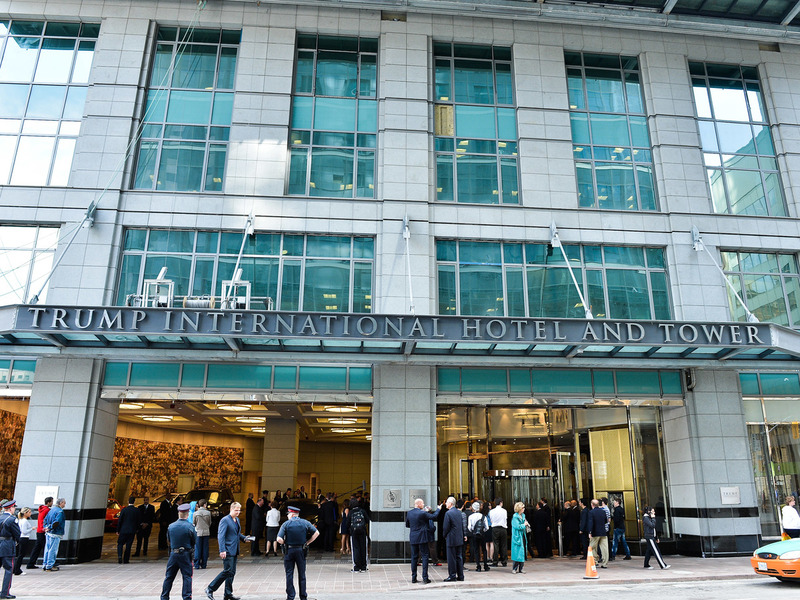 The Trump International Hotel and Tower opened in Toronto on April 16, 2012. In the years since, "There were parts of the building itself that fell down onto the street and actually shut down parts of our downtown at times, because there were concerns about the structure's integrity," says a city council member. The official address of Toronto's Trump International Hotel and Tower is 325 Bay St., in the middle of the city's financial district. Think of it as Canada's answer to Wall Street. But the hotel's entrance is actually around the corner. So instead of seeing a grand facade bearing the Trump name, what you see from the prestigious Bay Street side is a loading dock. This is just one of the many miscalculations that have undermined the Trump International Hotel and Tower, even before construction began in 2007. The soaring, 65-story glass and granite building has been plagued by financial setbacks, construction problems and legal woes. Investors have lost millions of dollars and have sued Donald Trump and the hotel's developers. The Trump project was developed by Talon International, a Toronto real estate development firm run by two Russian-Canadian entrepreneurs. Alex Shnaider owned the company and Val Levitan ran the day-to-day operations. Back when the idea for the project was first hatched, Toronto did not have a five-star hotel. There was a growing demand for hotels with lots of marble and granite, fine linens, luxurious spas and restaurants, says Susan Pigg, a former real estate reporter with the Toronto Star who covered the saga of the Trump hotel. "It looked great at the time because it was such a novelty for the city. Trump was a big, big name, it looked like it would be a huge success," she says. "But the whole thing was doomed to failure." Pigg says right off the bat, there were problems with the site. The hotel plus tower is built on a small parcel of land wedged between two smaller buildings. She says the site was so rocky, construction crews couldn't tunnel down as far as they would for building a high-rise in another part of the city. The building needed to be tethered underground, Pigg says, and parking was shifted to the first few levels. Part of the problem is that neither Shnaider nor Levitan had experience in hotel operations or construction. So it's not surprising there were problems, says Toronto City Councillor Josh Matlow. "There were parts of the building itself that fell down onto the street and actually shut down parts of our downtown at times, because there were concerns about the structure's integrity," he says. The developers signed a licensing agreement with Donald Trump similar to the ones for other hotels the president has been involved in. Trump has no ownership stake in the Toronto building. But his company, the Trump Organization, has a long-term management contract for the property, and Trump licenses his brand — his name — for a fee. Investors bought condominiums in the tower that could be rented out by the hotel. The investors claim they were promised sky-high occupancy rates and returns on their investment. Toronto lawyer Mitchell Wine says those never panned out. Collectively, the investors lost millions of dollars. Wine represents 27 investors, and many are members of Toronto's Korean community who speak very little English. "I remember asking them through interpreters, 'Why did you invest in this?' And all they said back was 'Trump, Trump, The Apprentice,' " he says. Wine says his clients felt the sales pitch misrepresented the project. He says they looked at the glossy brochures. They knew about Trump buildings elsewhere and thought he had the Midas touch. "He's splashed all over the marketing," Wine says. "My clients thought he was building the hotel, because he certainly gives you the impression that it's his hotel." Wine's clients sued Trump and the developers. A lower court threw out the suit. But an appeals court ruled last year that the lawsuit could proceed. The Trump Organization has maintained that President Trump is not liable because he never signed a contract with investors. If the lawsuit does proceed, it may be difficult for investors to recoup their money. The Trump hotel is now in receivership and up for sale. Journalist Susan Pigg says the development was built for about $500 million, and it's going for far less now, about $300 million. "I'm not even sure they'll get that," she says, "because who would buy a hotel like that, even at a discount, with all these lawsuits outstanding and no idea how this is going to be resolved?" In the audio, as in a previous Web version, we misstate Toronto lawyer Mitchell Wine's first name as Michael.